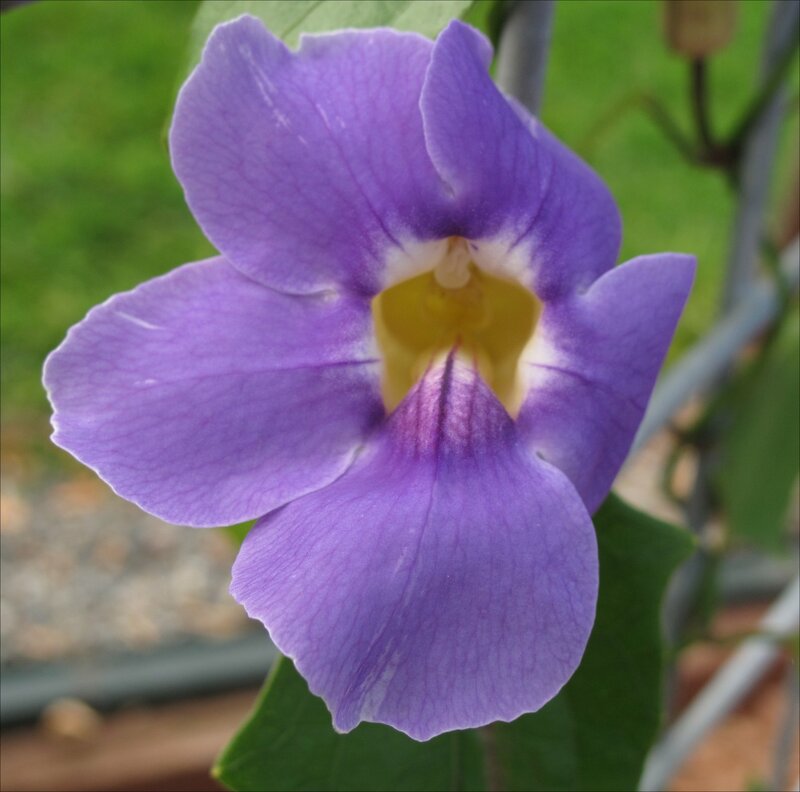 Native to northern India, Thunbergia grandiflora, is a vigorous, evergreen climber, especially when grown in tropical or semi-tropical climates. So if you live in Houston or San Diego you’ve probably seen this covering a fence in its full glory. But if you live in Western Washington, growing this vine successfully is a challenge. Here’s my less than vigorous vine getting ready to flower for the first time. This plant began as small seedling I ordered in May from Kartuz Nursery. It didn’t do much at all until the weather warmed in July, when I potted it on into a bigger container. Yesterday, two or three buds were getting ready to open. I hope to winter it over in my unheated greenhouse and by next summer have a more dense and flower laden vine. Like another favorite of mine, Orange Clock Vine (Thunbergia gregorii), Bengal Clock Vine twines in a clockwise direction. Blooms of different cultivars range from blue to light mauve and even white. Hardiness is generally 32° Farenheit, so even if its roots survive a frost, my guess is the plant would be less likely to recover fully. 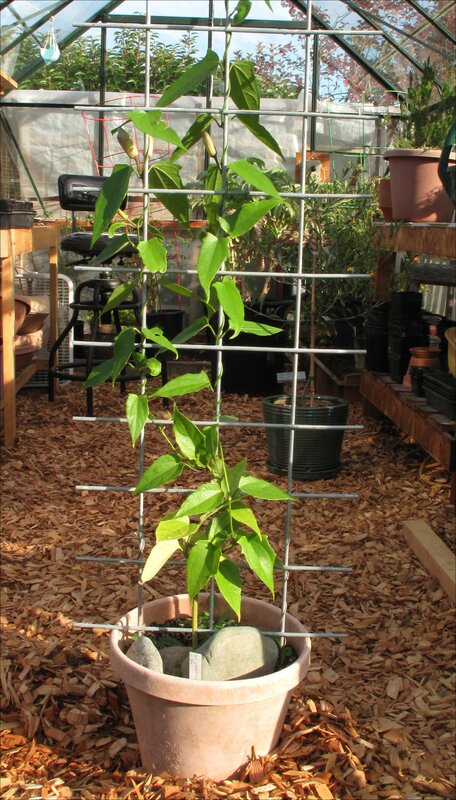 My plan is to keep my “cool” greenhouse above freezing all winter to ensure many of my “zonal denial” plants survive. There is another form of zonal denial that occurs to me. It’s not as common as the plant envy that drives my desire for the warmer climate’s flora, since it is driven by lack of cold winters. For example, folks living in the warmest parts of the country often have trouble growing peonies. Many plants won’t bloom in Spring without sufficient vernalization, which is a requirement for a prolonged period of cold temperatures. Peonies struggle where summers are long and hot and winter dormancy may be short at best. So do gardeners in southern California envy us for our Peonies? 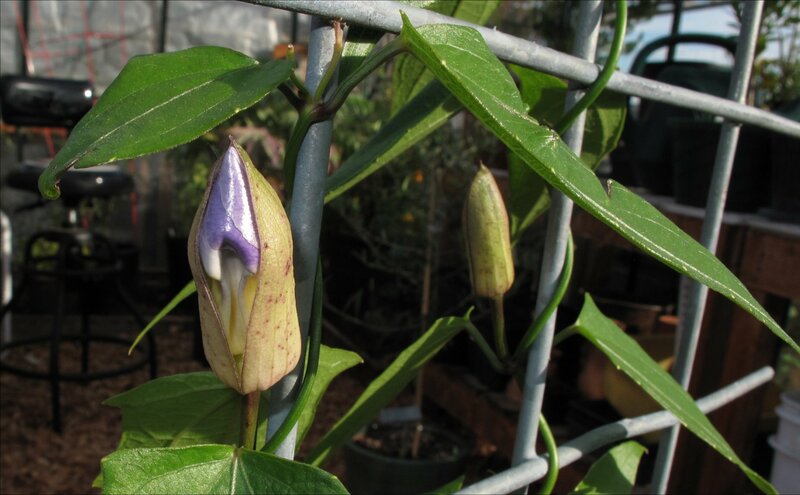 This entry was posted in Plant Picks, Zonal Denial and tagged Bengal Clock Vine, Blue Sky vine, Thunbergia gradiflora, vernalization, zonal denial by Bart Arenson. Bookmark the permalink. Beautiful flower, that blue reminds me of ‘Heavenly Blue’ morning glory. I hope you get more blooms in the future. Thanks so much for linking to my picture of the Bengal Clock Vine flower Sonel. Your photos are inspiring. Might you be Sonel Singh of Dehli?